Hungry? Want something extra delicious and extra quick? 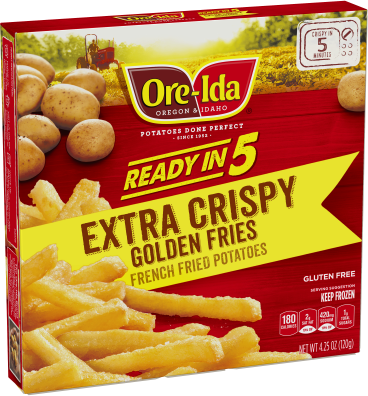 Our Ready in 5 - Extra Crispy Golden fries are crisp out of the microwave in 5 minutes. It doesn't get much easier than that! POTATOES, VEGETABLE OIL (SOYBEAN AND/OR COTTONSEED OIL), SALT, ANNATTO COLOR, SODIUM ACID PYROPHOSPHATE (TO RETAIN NATURAL COLOR).